Is it your engagement party or a special event organised for a loved one? From birthdays, baby showers, weddings, to funerals, trips around town, private meetings, hen and stags night or a simple night out, Ellesmere Port Minibus takes care of it all. We are most honoured and dedicated to being there for you, whenever you need transfer services around Ellesmere Port. All our 16 seater standard minibusses have quality spacing so that all guests can be comfortable even on, long-distance journeys. 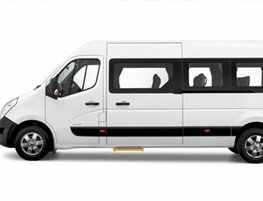 The large leg space in our 16 seaters helps you to have an easy ride and arrive without your legs being cramped or cranked from the journey. There is as adequate headroom space for air circulation. Are you a heavy luggage traveler? Well, the 16 seater has sufficient space to put all your things. All our Fords meet the necessary legal and safety requirements. The vehicles are equipped with fire extinguishers and first aid kits as a precaution. You can also breathe and travel in serenity as all our 16 seater standard vehicles have full;y functional heat and ventilation systems. The seats are fitted with seat adjusting mechanism for even more ampleness. Please, contact us if you are cleaning a journey for up to 16 people. Once you get in touch with us, we will get back to as fast as possible with further instructions and answers to your inquiries. You can contact us any day, any time. This vehicle is quite suitable for small sport teams or a small group of friends that require transportation to their hen and stag nights.